In 2016 the George Washington University was selected to be one of the newest NSF I-Corps Sites. 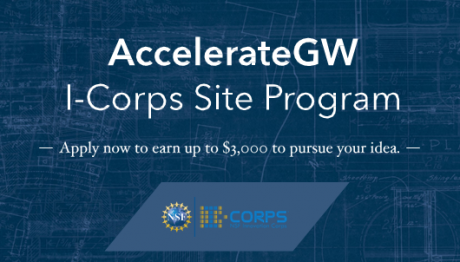 The I-Corps Site program at GW is called AccelerateGW, and like the other I-Corps Site programs, AccelerateGW is designed to educate researchers and technologists on entrepreneurial principles and practices and to give them hands-on experience in exploring potential, real-world applications of their technologies. The heart of the AccelerateGW Program is the GW Regional Introductory Course (RIC). The RIC is comprised of two face-to-face classroom sessions at the beginning and the end of a two-week period, each one approximately six hours long. In between the sessions participants interview prospective customers to determine how the participants' technologies might create value for the customers. Participants are expected to do 20 interviews during the two weeks of the course. The AccelerateGW program provides participants with grants of up to $3,000 to cover any expenses in doing customer interviews. The program requires a significant commitment of time, typically 10 - 15 hours per week. Technologists who wish to participate should be committed to learning about Lean Startup, Business Model Generation, Customer Discovery, and Technology Commercialization. All current GW undergraduate and graduate students, doctoral students, post-doctoral researchers, administrative staff, and faculty are eligible for the AccelerateGW program. Regional Introductory Courses are run at least 6 times per year. The current calendar is available below. Anyone wishing to apply for the AccelerateGW program can do so below. Successful completion of the AccelerateGW program makes researchers and technologists eligible for the national seven-week NSF I-Corps Teams program. That program provides $50,000 grants to teams of three who want to pursue the commercialization of their technology in more depth. Travel Expenses to consult with potential clients or experts as well as to attend relevant training. Travel costs are the expenses for transportation, lodging, subsistence, and related items required to meet with industry experts and prospective customers. Teams may not use I-Corps Site funds for legal or administrative costs.